When it comes to making a luxury brochure to show off your premium products, less is more. Don't give away everything to the reader so they're not enticed to find out more. Your products need to do all of the talking - use techniques to persuade them to find out more about the exclusive timepiece your company has to offer. Make them contact you to find out why your 5 star hotel is the only one they should visit, and why the luxury car in your state of the art garage are the only ones they need to come and test drive. This can only happen if you've created an effective brochure, so here are 4 tips for making a luxury brochure. By following this step-by-step guide, you'll be well on your way to creating a brochure that oozes luxury, and leaves the readers seriously impressed and wanting to purchase your premium products and services. While keeping it simple is often the best way to go to advertise premium products, if it matches the tone of your brand, then you might want to consider some folding options to stand out from the competition because it's something your audience will remember. However, sometimes keeping it traditional is the right method to use if folding options don't match your brand tone. If that's the case, then opt for a booklet-style brochure that can still do the same job effectively, but only if the other tips are incorporated too. A consistent colour and font scheme is a pivotal part of the layout that will help turn your brochure into a luxurious one. Again, think of the tone of your brand and decide on the type of colours that readers will associate with your brand. For example, Rolls Royce aren't going to be using purple or green in their brochures. They keep their themes consistent with darker colours, but it's still very appealing. You also need to decide on a handful of fonts - or typefaces. Although you need to avoid overloading your brochure with text, all of the text you include needs to be relevant to the premium products. Avoid common fonts that are associated with other brands, and those that won't match the tone of your brand. Instead, don't be afraid to pair different fonts together as they're designed to work in pairs or threes. Another key aspect of the layout is that you need to map out the sections clearly. Your information and images might be perfect, but the sections needs to take readers on a natural journey rather than making them lose focus by jumping from one section to another. Luxury brochures keep readers more engaged, if they lose focus then they're more inclined to put your brochure down because they won't understand the message you're trying to get across. If you're a premium jewellery company, then each high-end item should be focused on before moving onto another, rather than jumping back and forth. Photography and images are perhaps the most crucial aspect of any luxury brochure, as the visuals are what will make the readers more intrigued about finding out more and wanting to try or purchase the products. So, make sure you have the necessary equipment beforehand, such as a high-spec camera that can photograph even the finest of details. The resolution settings need to be correct, as the low resolution images end up pixelated and blurry once printed and that's not going to leave a good impression. Ensure the products you're photographing remain in focus so that the products appear much sharper on paper. Poor focus results in unusable images and readers won't be paying attention to the product or service you're trying to sell. To remain in focus, consider investing in a tripod so that the camera remains completely still and the photos will come out looking at their best with your high-end products in the limelight - as they should be. Remember to make the most out of natural light, and avoid flash if you really don't need it. 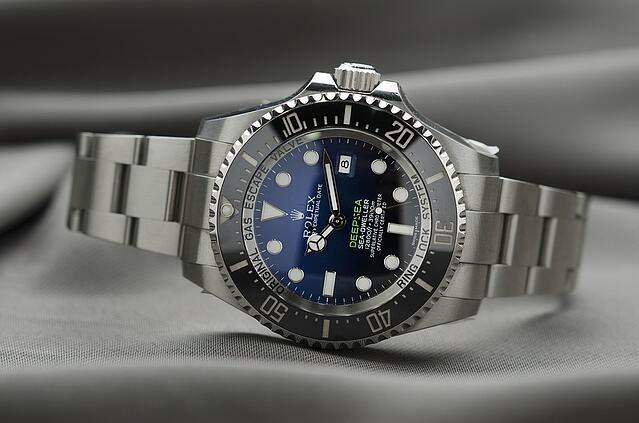 Flash can cause unattractive reflections and can wash out your images, especially in the cases of watch faces and jewellery. Luxury cars, for example, need to be photographed outside and natural light is often the best way to showcase the features. If your products need to be worn by models, such as an expensive necklace or earrings that will have somebody's face in the brochure, then it's crucial that you avoid red eye. There might be settings on camera that can eliminate red eye, so make sure you use it so that readers aren't distracted and the brochure remains looking professional. It's also important to experiment with different angles. Show off your premium products much better by avoiding taking pictures straight-on. Get up close and personal so that you're creating brilliant colours and shadows. The aim is to make your premium products stand out. So, put some thought into the composition of the photos you're going to be taking. Make sure there's nothing in the background that will distract readers and shift the reader's focus away from the products. Also, get much closer to your products when photographing them to fill the frame of the photo with your product. The closer you get, the more detailed it will be and the more features you'll be able to show off to readers. Even if you combine all of the other techniques perfectly, picking an average stock can damage your chances of successfully advertising your products, and could even have an affect on your brand image as readers won't be impressed with poor quality materials if you're offering high-end items like watches or cars. The creativity of your premium products can't fail to be enhanced with speciality luxury materials, so make it memorable and choose a high-quality stock. There are several types of stock out there that you can utilise that will leave readers impressed by the feel. For example, silk coated paper has a low surface sheen and a truly luxurious feel while providing excellent ink to paper contrast. This coating makes the colours appear a lot bright and more defined, along with it being a better choice for readability. Other content included won't be compromised as readers will be able to read everything easily, the coating assists your products by looking a lot more premium as they will stand out a lot better. When readers know a lot of effort has gone into it, they'll know your brands and products are different from the rest. If you're after a more outside-of-the-box stock, then materials like Lux and Constellation Snow are materials that can be beneficial to premium products. Lux provides a more classic feel which suits older cars, watches and hotels, and brings an ultra-thick, triple layered card to the table. Constellation Snow, on the other hand, comes in a high-quality, white uncoated paper and card with aunique embossed linen effect which readers won't see everyday. 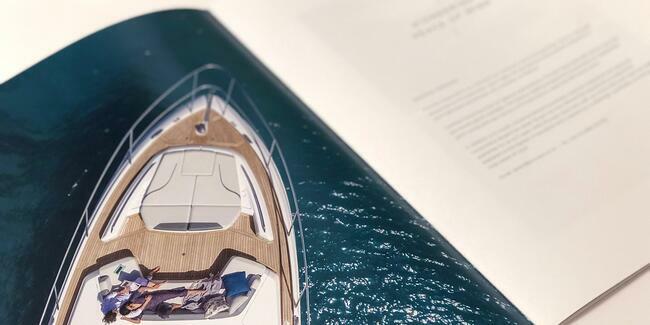 Uncoated paper can also provide a luxurious feel to the brochure. In general, this stock has a soft finish and tactile quality which will feel nice in the reader's hands because it's more absorbent than coated paper, and the ink appears much flatter on this modern choice. 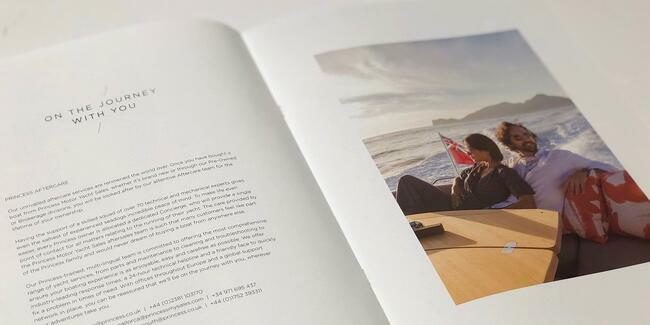 To round it all off, picking the right print technique is one of the more important tips you need to be aware of when making a luxury brochure. For brands like yours that are searching for that quality, luxury feel, LED UV printing is the most beneficial method to use because it allows printing on various types of paper and materials. How does it benefit you? Well, this technique boasts a quick-drying process, meaning it's consistently perfect quality to match your premium products with no markings or blemishes, but the turnaround times are much quicker. So, you won't be waiting around forever before your premium brochures are ready to distribute. This technique also means you won't have to compromise on quality and your premium products will be advertised as just that, because the colours remain more vivid, brighter and sharper to enhance the smallest of details of the premium products and services on offer, as the ink doesn't sink into the materials. If you're using LED UV printing, then link this with the previous tip and choose a stock that works best with this technique. In this case, consider uncoated paper to make your brochure reach its full potential and your luxury products will be doing all of the talking. With LED UV being the future of printing technology, it makes sense to market your premium products in this way and the fact that these brochures are bespoke means it will fit to cater for all of your needs. Finding the right way to produce a high-quality brochure to show off your luxury product is all about letting your images do the talking. In the blog post we have outlines how to create a luxury brochure but for even more tips and advice download our guide of about how to produce a luxury brochure.